Spring is near. Spring is near. Oh, I hope so! 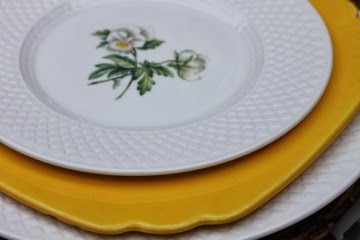 The pansy accent plates that coordinate with the plain white Mansard by Spode made me think of my grandmother's yellow dishes. The yellow plates and bowls have no markings. 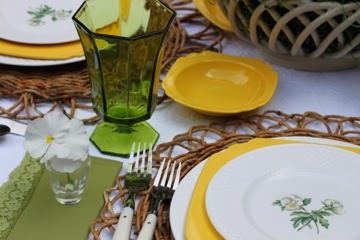 This tablescape makes me think spring since it has been such a long winter. 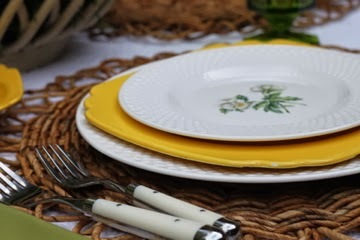 I love the shape of the yellow plates and bowls. Linking to: Seasonal Sundays, Mosaic Monday's, Inspire Me Tuesday, The Scoop, Wow Us Wednesday,Lets Dish, What's It Wednesday's, Open House Thursday's, Tablescape Thursday, Share It One More Time, Feathered Nest Friday, and Be Inspired Friday. 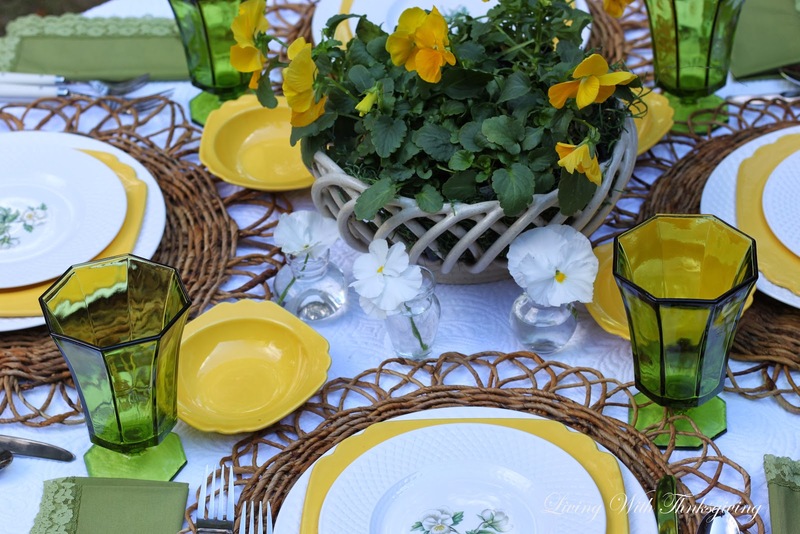 Your tablescape is beautiful, and yes...it sure looks like Spring! I love the delicate flowers on the dishes. So pretty. I also really like how you placed a teensy little posey at each place setting. That's neat! Enjoy your weekend...what's left of it, anyway, and have a great week ahead! Oh I am so ready for spring. Winter has been brutal this year so any sign of spring is truly a welcomed thought. Your table is certainly a sign of spring. So bright and happy. Very beautiful and cheery. We have snow again here in Kansas City so yes, I am ready for Spring. 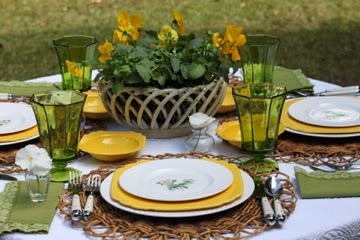 Beautiful table, your colors are so springy. Very pretty pattern and thanks for sharing. What a lovely spring table! Your grandmother's bowls and plates are Riviera by Homer Laughlin, made in the 1930s and 1940's; you're lucky to have them. Wow, thank you Margaret! I am glad to know what they are. The time frame is right. I am very glad to know the name and make of the dishes that were my grandmothers. I would email you but nothing happens when I click on your name. Hope you see this note. I'm so pleased that I could help. What pretty dishes,Connie! They are perfect for a springtime table. How did the 70s end up with so many cool glasses!? And then on your table! Lucky duck. I only wish I had the kind of space you must have to store all of this awesomeness! 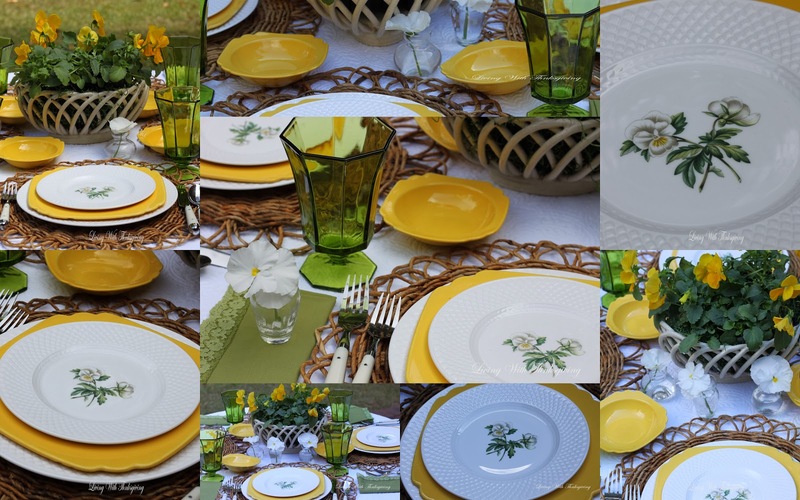 And your whole tablescape, so bright and cheery, perfect for spring! Do you love statuary like I do?